NOTES: Short run with resin bits. Built pretty much to the same specs that produced the A-20 and B-25, the Martin type 167 was tested as the XA-22, but not accepted by the USAAC. 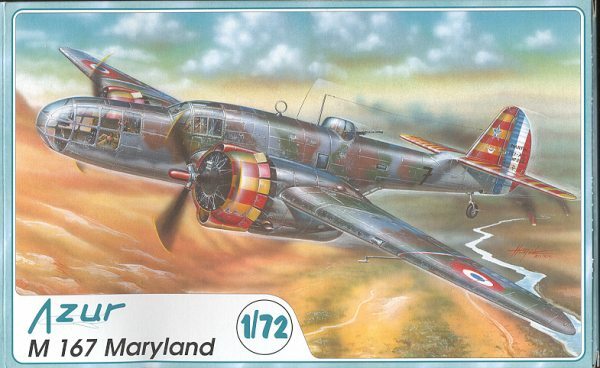 With the clouds of war looming on the horizon, the French realized that they were woefully short of modern military aircraft so were buying anything that looked promising. Among the planes they bought was the Martin 167, 111 of them being purchased straight off the drawing board, with another 100 added when the results of testing were finished. Eventually 140 aircraft arrived in France before the collapse, many of them being flown out of occupied territory before the armistice and later serving with the Vichy Air Force. Those not delivered to the French were bought by the British who added another 75 to the order and it went into RAF service as the Maryland. An additional 150 upgraded versions were bought as the Maryland II and these served mostly in the Desert air forces, though some also performed as target tugs back in the UK. One part that I think should have been done in resin are the engines as while they are OK, they are not really that well detailed. They are 9 cylinder radials and my limited references state that the plane had Pratt & Whitney R-1830s. If memory serves me, those were 14 cylinder, twin row radials so should have 7 cylinders showing in the engine face. That being the case, you may want to consider replacing the kit items with something more appropriate. You'll also have to spruce up the main gear wells as there really isn't anything in there but a place to glue the strut. The engine nacelles are an interesting construct as they are split vertically instead of horizontally as is the norm. This should make nacelle to wing mating a bit more precise. It will be most interesting to see how this all turns out. 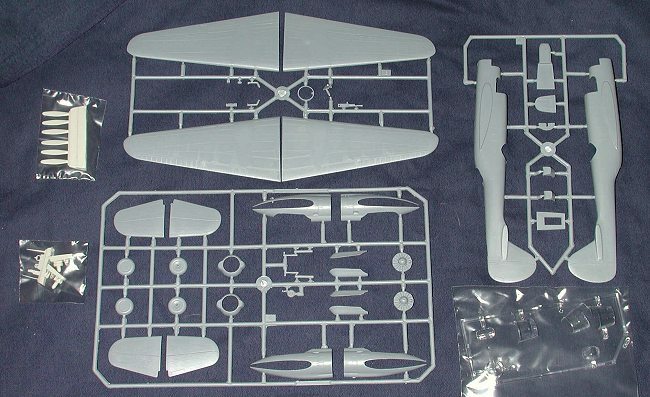 The instructions are quite typical of the MPM family of models with the usual pictorial diagrams and color information. Decals are superbly done and it looks like they finally have the blue dark enough. You get markings for the box art plane, but you'll have to paint on the red and yellow Vichy stripes. A nice touch is that there are separate serials for the rudder in case you wish to paint those stripes as well. The other markings are for a generic desert air force plane in dark earth and middle stone over azure blue. 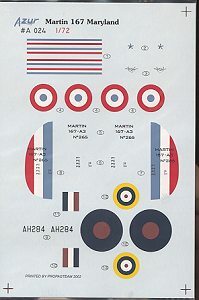 Interestingly, there are no under wing roundels for the RAF version. I would have though they'd be carried but again, I have little in the way of references on this plane. Regardless of which option you choose, it should make into a very nice model. I've always like the Maryland and am pleased to see a more up-to-date version of it finally hitting the shelves. If you have built short run kits before, then this one should pose no problems as it seems pretty straight-forward, thanks to the minimal resin and lack of vac clear bits. If you would like your product reviewed fairly and quickly by a site that has well over 100,000 visitors a month, please contact me or see other details in the Note to Contributors.